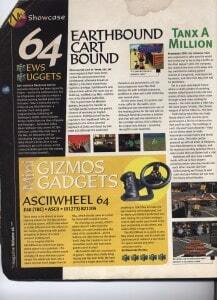 OmniM sent me this the other day, it’s another magazine article discussing EarthBound 64. It’s surprising how many game magazines there were out there covering EB64 – most of the info is all just recycled between magazines but it sure got a lot of coverage worldwide! Hello, I am OmniM and got a magazine scan about EarthBound 64. 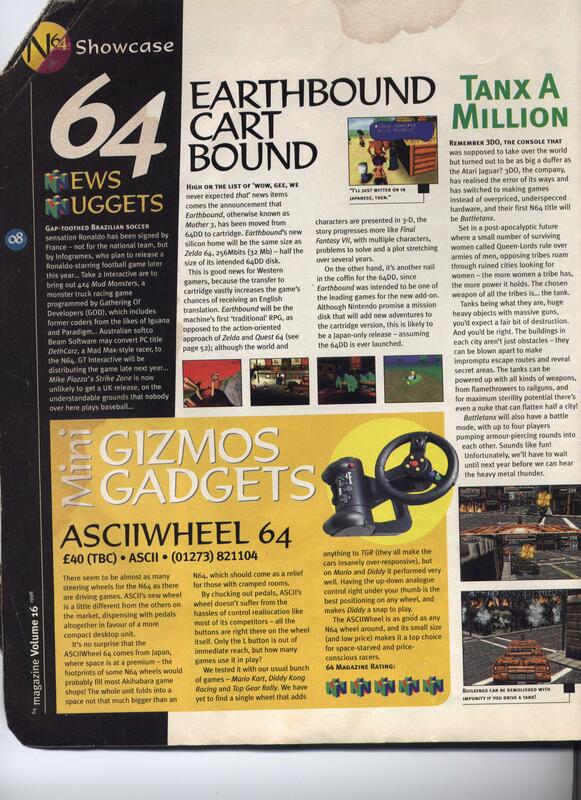 It is in a UK magazine called 64 Magazine and it is Volume 16, 1998. I got this magazine in a store a long time ago(don’t remember the store’s name) and I kept it as a weird souvenir because it is a British mag. Anyway, I noticed an interesting scanned magazine article on the site. The user “Pippo” posted some scans from a magazine called “N64 Magazine” and said it is a UK mag. After I read that, I got reminded of my UK magazine and wondered, “Are they made by the same people?” The name is TOO similar(N64 Magazine and 64 Magazine) so I decided to send the scan to you. The article is nothing special though(just the same pictures you seen already)but it mentioned that the game would be closer to an English translation and several comparisons to LoZ:OoT, Quest 64, and Final Fantasy. What do you mean? It did come out. Just on the GBA instead of N64. There’s a lot shared between the two versions but also a lot of differences and stuff that got cut out. It also might’ve meant the series would’ve heen less neglected by NOA and other branches. It’s awesome yet depressing reading about EB64. I vaguely recall reading Itoi saying he wanted to make EB64 something ‘truly special’ and it seems as though he was on the cusp of that. It also seems that a lot of the stuff that got cut would have made the game truly amazing. That picture of the Claymen in the factory is new to me. I may have just missed it, but has anyone seen it before? They kind of look like Minecraft Creepers, but with arms and legs instead of just feet. Pretty spooky. It’s nice to see we’re still finding out about this mysterous prototype. It looks like EB64 would’ve been released all around the world, and sadly, M3 wasn’t. Fnar, people talk about how Mother 3 is essentially Mother 64 but I don’t doubt for a second they’d be all over the rom if it was ever uploaded. There was a kid with a red hat and a blue/yellow striped shirt. Was there supposed to be a character that looks like Ness? Did he get cut out? Is he Claus. Or is he the guy who sells you steak near the beach who is rumored to be Ness? Wait why are you controlling him? Was he a playable character. Was he actually Ness but when he got a little older and met Lucas? This is confusing!!!!!!!!!!! Maskedsaturn, I’m pretty sure that the Ness in the older screenshots was intended as a placeholder for Lucas while they were still working on his final design. You can see on the Starmen images page for EB64 that they went through at least two different 3D designs for Lucas (not counting the Ness placeholder).